As an exemplar of urban planning, Jaipur is unique and futuristic in its urban heritage that informs the idea of it as a centre of trade and commerce and a creative hub for arts and crafts. It is a city with a distinct artistic identity. The Jaipur Heritage Management Plan prepared in 2007 was one of the first heritage planning initiatives at urban level in India, followed by similar attempts for other Indian historic cities such as Madurai and Varanasi in 2008–2009. These initiatives were recognized by the Ministry of Urban Development and impacted the inclusion of city-level heritage plans in the revised toolkit under urban renewal mission in 2013. The Heritage Management Plan of Jaipur became part of Jaipur Master Plan 2025 and is recognized as a Best Practice example by the National Institute of Urban Affairs, Ministry of Urban Development Government of India in 2015. Key schemes for the walled city of Jaipur, including the Management Plan for World Heritage Site of Jantar Mantar, are now being implemented as part of the Smart City Plan under the Ministry of Urban Development. Besides achieving World Heritage Site inscriptions for Jantar Mantar (2010) and Amber Fort as part of a serial site nomination (2013), Jaipur was designated as a City of Crafts and Folk Art, as part of UNESCO Creative City Network, in December 2015. As part of this commitment and recent nomination of Jaipur Walled city for World Heritage in 2018, Municipal Corporation of Jaipur will be upgrading and implementing urban conservation works in craft streets in the historic city. 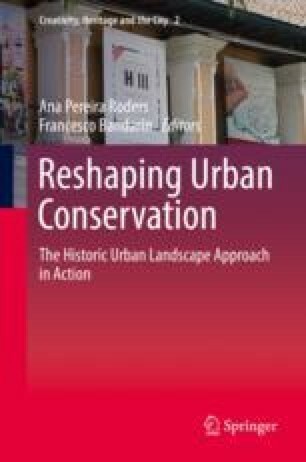 Through the case studies of conscious heritage planning and urban conservation projects in the city of Jaipur since 2007, this paper demonstrates how Jaipur fosters the creativity and imagination of its people using its rich cultural resources to showcase a model of sustainable development as promoted by the UNESCO 2011 Recommendation on the Historic Urban Landscape.